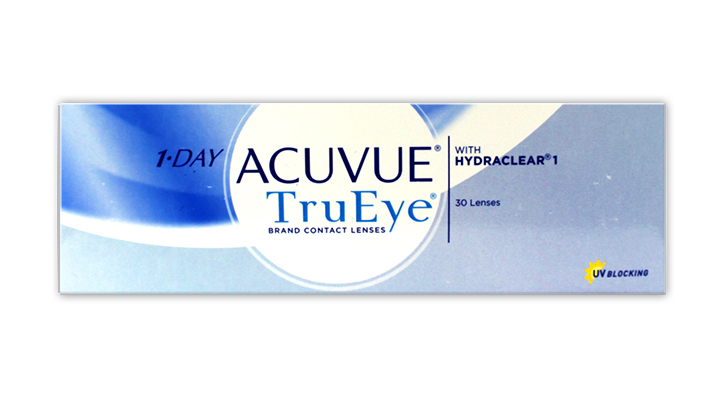 The latest generation of Acuvue daily contact lenses is the 1-DAY ACUVUE TruEye. This advanced lens combines the benefits of more oxygen transmission (98%) with the highest UV protection (96% of UVA and 100% UVB blocked) to bring you a contact lens that can be worn comfortably and safely each day and then be thrown away. The TruEye contact lens is a world first for incorporating a new generation silicone into a daily lens, the result is a contact lens that lets almost 100% of the oxygen in the air to your eye. 1 Day Acuvue TruEye also has a high volume of moisture rich wetting agent embedded in the lens, making the lens ultra smooth for all day comfort. 1-DAY ACUVUE TruEye also have a visibility tint for ease of handling and a `123` indicator for ease of insertion. Each box contains 30 daily disposable soft contacts in buffered saline solution. 46% polymer (Narafilcon A or Narafilcon B) 52% Water. Sadly, unlike most of the other people here I�ve actually been a little disappointed with these lenses. They�re certainly not bad lenses or particularly uncomfortable but I would say that upon insertion (which is occasionally fiddly due to their size) they are less moist than the cheaper Acuvue Moist lenses. True, they don�t degrade in their moisture throughout the day as badly but for the price and the reviews � I was expecting better. Hi I have been wearing acuvue moist for the last 12 months which are a really good soft lens and are comfortable. how ever I am always looking for the next generation of lenses to which I came across daily acuvue truEye lenses which are a new silicon type of lense with a higher air and water percentage unfortunately they are only available in the minus powers where I am in the + power. is there any reason why they don`t cover both minus and positive powers?? Good but solution burns and eyes sometimes go red. Lense is good. Can last a long time. However, the solution burns my eye initially. This does subside. For a box of 60 lenses only 1 was deformed and unusable which is not a bad result to be fair. Once I had to wear the same lense 3 days in a row (long story) and it was perfectly fine. No discomfort - even when i slept with it in. Also, sometimes my eyes will go red with these lenses. It's not really related to how long they are in for though. Once I had to wear the same lense 3 days in a row (long story) and it was perfectly fine. No discomfort. I sometimes find the misshapen lenses that others have referred to but if you put them in anyway once in your eye the lens recovers its normal shape and there is no problem with them. What I find more annoying (but this has happened with all the lenses I have tried) is when you open the pack and find the lens inside out, and then you have to manipulate it with your fingers to get it the right way round which makes the lens dirty before you even put it in your eye. The manufacturers really should address this because the whole point of daily lenses is that you don't have to clean them so I don't usually even have saline to rinse them and normally just throw the inside out ones away. I`ve had the same experience as others with misshapen lenses, not loads but enough that I`ve noticed it. However that is not the main problem I`ve had with these lenses. I switched from Acuvue moist to these to try them out and was pretty dissapointed. It may have just been my eyes as a lot of people rate these but they irritated my eyes and became uncomfortable after about 4 hours of wear. Maybe I`m allergic to the material or somethingbut I`m going back to acuvue moist, which thankfully are cheaper. Editors Comment: It can be the higher silicone content in the lens, which is basically a hydrophobic material. However, it is great for oxygen transmission. I agree with a lot of the poor reviews. Usually about 3 pairs are misshaped and unwearable. Occasionally I've experienced cloudiness too so I never go anywhere without a few spare sets in my bag! As frustrating as this is, most of the time ( when you get a good pair) they are the most comfortable lenses I've had and I can wear them for hours and hours without my eyes feeling sore. They are not ideal for reading in but I find that with all lenses. I wouldn't go back to any others as when I tried a cheaper alternative I could only manage about 10 hours in them.